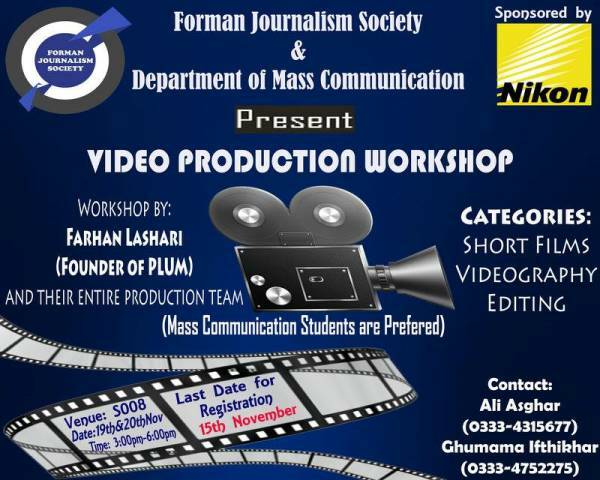 The Department of Mass Communication and Forman Journalism Society is arranging 2-days Video Production Workshop by Farhan Lashari (Founder of PLUM) and his Entire Crew on 19 and 20 November 2014 in S-008 from 3:00 pm to 6:00 pm for the students of Mass Communication Department. The expert will be training students about techniques of Short Film Making, Videography and Editing. The last date for the Registrations is 15 November 2014.